Conservative MP Pierre Poilievre stands during question period in the House of Commons on Oct. 18, 2017. The accusation opened a new front in the ongoing opposition-waged war on government taxation policy, amid the backdrop of the conflict-of-interest controversy dogging Finance Minister Bill Morneau over whether he's properly distanced himself from millions of dollars of private sector assets. 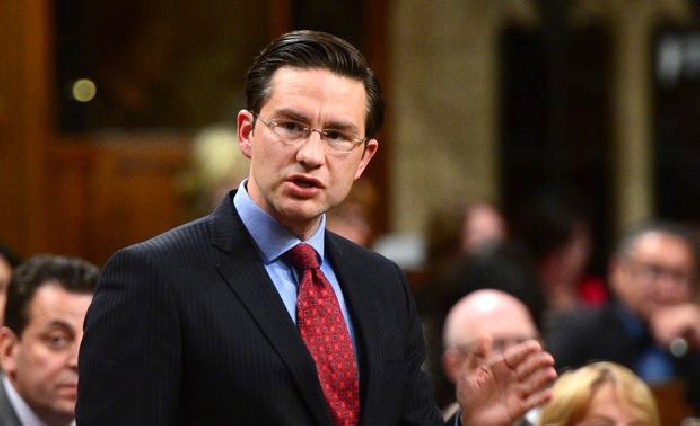 Conservative finance critic Pierre Poilievre branded it as one more example of an out-of-touch Liberal government that he characterized as unfairly targeting the hardworking middle class people it claims to support. "His tax department tried to tax the employee discounts of waitresses and cashiers. Now his government is targeting vulnerable people suffering with diabetes with thousands of dollars in tax increases," Poilievre said on Sunday at a Parliament Hill news conference flanked by fellow Conservative critics, a young diabetic constituent and a top official with a leading diabetes advocacy organization. In May, the revenue department stopped approving a disability tax credit for people with Type 1 diabetes for those who had previously claimed it, he said. People who need more than 14 hours per week for insulin therapy, and had a doctor's certification previously qualified. But other than citing a spike in applications for the benefit, the government offered no explanation for the change during initial interactions earlier this spring, said Kimberley Hanson of Diabetes Canada. Thousands of claimants from across Canada who had previously been given the $1,500 annual benefit have been rejected in recent months, but Hanson said she can't get an exact number from Canadian Revenue Agency and has had to file an Access to Information request to find out. In recent months, the agency officials and Minister Diane Lebouthillier have for the most part rebuffed their overtures. "Over the past two months, she's stopped responding to my messages and answering some of my questions," Hanson said, referring to one senior department official. On Saturday, a senior department official reached out to her to reopen dialogue, she said. Poilievre said that only happened because the matter was raised briefly on Friday by the Conservatives during Question Period. The minister's office did not immediately respond to a request for comment on Sunday. "Applicants are now being denied on the basis that 'the type of therapy indicated does not meet the 14 hour per week criteria.' These denials are in contradiction of the certifications provided by licensed medical practitioners and do not appear to be based on evidence," says an Oct. 3 letter to Lebouthillier, signed by Diabetes Canada, the Canadian Medical Association, the Canadian Nurses Association, the Canadian Society of Endocrinology and Metabolism and two other organizations. This latest complaint about the government's tax policy comes after the Liberals were forced to reset proposed tax measures after weeks of vocal opposition from small business owners, doctors, farmers and backbench Liberal MPs. The Canada Revenue Agency was also recently forced to withdraw a notice that targeted employee discounts after it caused an uproar. "It's not like I can snap a finger and this disease turns off," said Madison Ferguson, a constituent of Poilievre's who first raised it with her MP this summer after her claim was rejected. She said she has to constantly calculate the effect of what she eats, while monitoring her blood sugar levels as much as four to 10 times a day, using test strips that cost $1.50 to $2 each time. "It's quite expensive but it's needed because without this I wouldn't be here," said Ferguson. "So every moment of every day has to be calculated."